Only a limited supply will be sold. Platinum season pass is available to all residents of Miami-Dade County. Resident Status is determined by valid driver license or property tax bill. Tax bill must be in the name of the person purchasing the card. Platinum season pass is non-transferable and non-refundable. 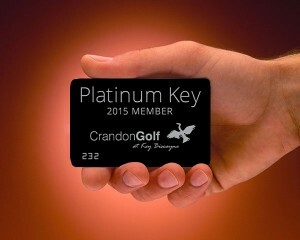 Platinum season pass includes all green fees, cart fees & taxes from April 15th to November 10th 2019 at Crandon Golf @ Key Biscayne. Platinum card holders includes Patron Card benefits + 9 days advance tee time reservations. Platinum card holder’s accompanied guests receive Patron Card Rate from April 15th to November 10th and the Miami Dade Resident rate all other times. 10% discount on merchandise in the Golf Shop. 20% discount on Range Fobs. Access to a locker of their choice for one year. Terms and Conditions subject to change. Please see golf shop for all questions.